Moves the sprite forward a specified number of steps in the direction the sprite is facing. When the green flag is clicked, the sprite will move forward for 10 steps. Turns the sprite (clockwise) a specified number of degrees. When the left-arrow key is pressed, the sprite will turn clockwise 15 degrees. Turns the sprite (counterclockwise) a specified number of degrees. 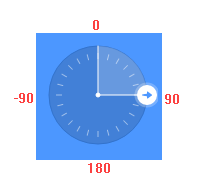 When the right-arrow key is pressed, the sprite will turn counterclockwise 15 degrees. Moves the sprite to a random position, the mouse-pointer, or another sprite. When the green flag is clicked, the sprite will move to a random position. Moves the sprite to the specified (x, y) position of the stage. When the green flag is clicked, the sprite will move to (0, 0). Glides the sprite to a random position or the mouse-pointer, taking as long as the specified amount of time. When the green flag is clicked, the sprite will glide to a random position in one second. Glides the sprite to a specified (x, y) location, taking as long as the specified amount of time. When the green flag is clicked, the sprite will glide to (0, 0) in one second. Points the sprite in the specified direction. The 360-degree circle is used for this block. When the green flag is clicked, the sprite will face to the right. Points the sprite towards the mouse-pointer or another sprite. When the green flag is clicked, the sprite will point towards the mouse-pointer. Changes the x position of the sprite by the specified amount. When the left-arrow key is pressed, the x position of the sprite will increase by 10. Sets the x position of the sprite to the specified amount. 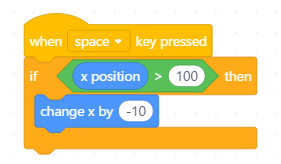 When the space key is pressed, the x position of the sprite will be set to 0. Changes the y position of the sprite by the specified amount. 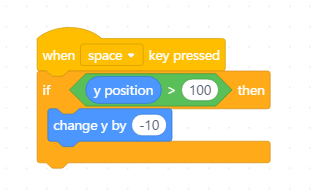 When the up-arrow key is pressed, the y position of the sprite will increase by 10. Sets the y position of the sprite to the specified amount. When the space key is pressed, the y position of the sprite will be set to 0. If the sprite touches the edge of the screen, it bounces back in the opposite direction from which it is coming. 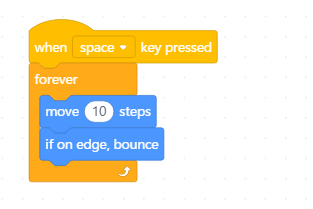 When the space key is pressed, the sprite will move forward for 10 steps. If the sprite touches the edge, it will bounce back. When the green flag is clicked, the rotation style of the sprite will be set to left-right. The x position of the sprite. When the space key is pressed, if greater than 100, the x position of the sprite will decrease by 10. The y position of the sprite. When the space key is pressed, if greater than 100, the y position of the sprite will decrease by 10. The direction of the sprite. When the space key is pressed, the sprite will say the position in which it is pointing.